“Grounding” starts to gain popularity as more health professionals acknowledge its benefits, especially in lowering free radical damage, stress, inflammation, and pain. The focus of earthing is to reconnect our body’s innate healing abilities with the earth itself. It’s so simple and can be done everywhere. You only have to take off your shoes and walk on earth with bare feet. As you do this, your body starts to absorb electrical charges from the earth through your skin, which acts like a conductor. According to earthing expert Clint Ober, our body is electrical first and chemical second. Our brain, heartbeat and neurotransmitter activity, for example, all rely on electrical signals. When our electricity is off, so can be certain aspects of our health. By being in touch with the earth, we’re taking advantage of the earth’s negative charges that create a stable internal bioelectrical environment for the normal functioning of all our body systems. These are also crucial in setting our biological clock, regulating of circadian rhythms, and balancing our cortisol levels. Here are the specific benefits we get if we go out there and ground our feet with the earth. The influx of free electrons from the Earth’s surface is thought to neutralize free radicals and reduce both acute and chronic inflammation and accelerated aging. Earthing and grounding experts believe that this practice improves circulation, making it easier for nutrients to be distributed throughout the body and for toxins to be carried out of the body. Circulation can also boost the energy levels and reduce swelling. Inflammation, which triggers a lot of diseases, is said to be due to a lack of electrons in the tissue. When you’re sick, the body responds by delivering reactive oxygen species to the site of the injury in an attempt to heal and defend you. This triggers an inflammatory response causing the free radicals to leak into the surrounding tissue and damage the other healthy parts of the body by increasing swelling, pain, heat, and redness. To control the damage created by the free radicals, we eat plenty of antioxidant foods. But we can get these same natural antioxidants from the free or mobile electrons from the earth, which has the capacity to resolve chronic inflammation. Certain points in the balls of the feet can absorb electrons when they touch the ground. These electrons then move throughout the body where the free radicals are forming and cancel them out, stopping the damage caused by them. 2. Grounding helps reduce stress and stress hormones. 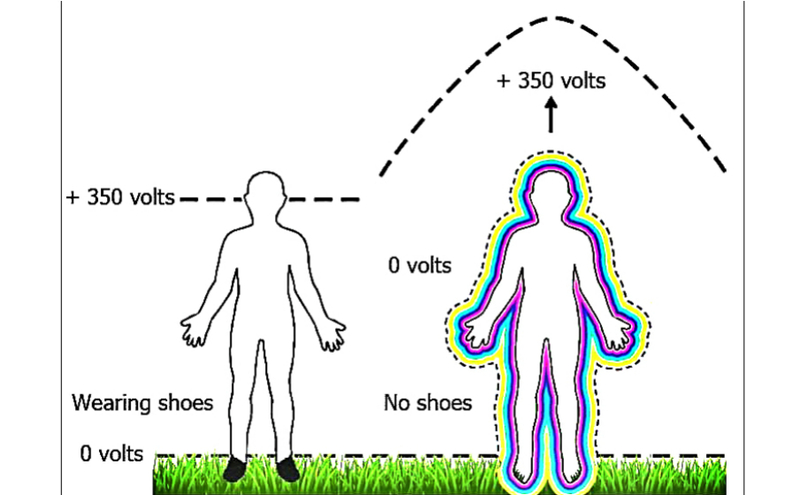 One double blind study investigated the effects of earthing on 58 healthy adults. To read their electrical signals, the researchers used conductive adhesive patches that are placed on the sole of each participant’s foot. The subjects were then exposed to 28 minutes in the unearthed condition followed by 28 minutes with the earthing wire connected. Controls were unearthed for 56 minutes. These changes are believed to signify positive changes and lower stress reaction. 19 of 22 earthing participants also experienced decreased blood volume pulses (BVP). After considering the effects on electrophysiological properties of the brain and musculature as recorded using EEG, EMG and BVP readings, the findings suggest significantly higher reductions in overall stress levels and tension results in the earthing participants compared to the control group. 3. Grounding helps in having a better sleep. A study by the Journal of Alternative and Complementary Medicine published in 2007, found that connecting the human body to the earth during sleep (earthing) normalizes the daily cortisol rhythm and improves sleep patterns. This is because stress hormones have an effect on the natural circadian rhythm of our body. When our bodies are not in line with the natural rhythms of the earth, including the patterns of light and darkness or “electrical” charges, our sleep and immunity suffer. In short, too much stress causes poor sleep. 4. Grounding helps to increase energy levels. Physiological stress is closely related to the levels of cortisol in the body. Stress impacts cortisol while cortisol increases the response to stress. As this cycle continues, fatigue and sleep problems start to develop as well as the craving for low nutrient foods, sugar, and excess calories and can ultimately lead to low energy levels. But as you start to practice grounding, you will start to have better sleep and improve your hormone levels. When you enjoy all these, your energy levels will soon increase. 5. Grounding helps lower pain. In most cases, inflammation is the major cause of pain. By lowering inflammation, its very possible to help combat pain caused by chronic autoimmune disorders, injuries­­­­, headaches, menstrual problems and other health problems. One 2010 pilot study compared the pain levels of adults who were grounding compared to a control group following intense exercise that caused muscle soreness. The results showed that grounding the body to the earth altered measures of immune system activity and pain. Among the ungrounded men, there was an expected, sharp increase in white blood cells (sign of an inflammatory response) and greater perception of pain after exercise. In comparison, the grounded men had only a slight decrease in white blood cells, indicating less inflammation and experienced shorter recovery times. Because there is no minimum amount of time that is required in earthing, you can start the practice by walking barefoot to check your mailbox, mowing your lawn and weeding out your garden with bare feet, or lying directly on the sand while at the beach. There are just unlimited ways to ground yourself. However, when directly touching the earth is not possible, several products are now available in the market such as the electrically charged beds, earthing mats, and earthing bands. On the other hand, while these products help, nothing beats the practice of walking barefoot directly on earth. This not only makes you heal faster and reduces your stress, it’s also a good way of getting vitamin D while having a physical exercise too. Doing it at least 30 minutes a day will give you all of the above benefits.